The following article is from the Russian encyclopedia titled, Historic and Geographic Dictionary of the Saratov District, compiled by A. N. Minkh, a member of the Saratov Scientific Archive Commission, and published in Saratov in 1898. The translation of this article and the related notes are provided courtesy of Dr. Lyudmila I. Koretnikov. Norka, also known as: Norki, Staraya (Old) Norka. A German colony and Volost (small rural district) center of Norka Volost, Kamyshin uyezd (district), 2 districts of Zemstvo Head is located in the north of Kamyshin uyezd, 4 verstas from the boundary with Saratov uezd. It is located 51 degrees 10' North in latitude and 15 degrees East in longitude from ﻿Pulkovo﻿ on both banks of the Norka river, which shares its name with the settlement. The river starts 2-3 verstas to the west from the colony. There are 8 convenient descents to the river and 4 wells. The altitude 1 1/2 – 2 verstas to the north from the settlement is 810 English feet over the level of the Black sea. It is one of the oldest colonies in the Volga region: according to Klaus (Our Colonies, 1869) the first settlers came here from different regions of Germany asked by Catherine the Great in 1764-1766. Before 1864, the colony was a vast Norka county that comprised such colonies of Atkarsk uyezd as Grechinaya Luka, Krestovy Buerak, Peskovatka and what is called now Norka, Oleshnya and Linevo-Ozero volosts. 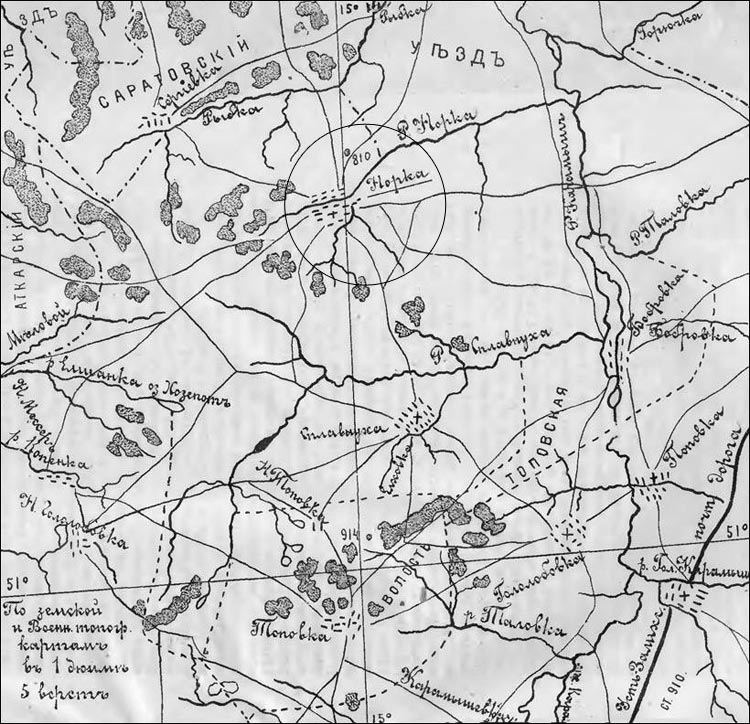 Map from the Russian encyclopedia titled, "Historic and Geographic Dictionary of the Saratov District," compiled by A. N. Minkh, a member of the Saratov Scientific Archive Commission, and published in Saratov in 1898. Norka (Russian = Hopka) is circled. According to Norka Volost Board, Norka was founded in 1764 and almost at once a German Church school was opened. According to the 1859 List of Foreign Settlers (by A. Klaus) Norka, Norka county had: according to census #5 (1788) – 206 families, 690 males and 668 females; according to census #6 (1798) – 225 families, 845 males and 815 females; according to census #7 (1816) – 300 families, 1,274 males and 1,235 females; according to census #8 (1834) – 445 families, 2,095 males and 2,018 females; according to census #9 (1850) – 465 families, 3,081 males and 2,870 females; according to census #10 (1857) – 628 families, 3,251 males and 3,049 females. According to the list of settlements of the Central Statistics Committee, published in 1862, the German colony Norka was shown by the Norka river, 110 verstas from the uyezd city Kamyshin. In 1860 there were in it: 483 households, 3,289 males and 3,065 females, total: 6,894 persons of both sexes; 1 Reformed church, 1 school, 2 fairs, 5 tanneries, 3 oil-mills, 21 mills. In 1851-1852 270 males and 250 females, total 520 people moved to the Ilovlya river, where they founded a new colony: Neu (New) Norka, Ilovlya volost. According to 1886 Zemstvo Census there were in Norka: 877 households, 3,898 males and 3,743 females, total: 7,641 people of both sexes, Germans, Reformists, also there were 322 families constantly absent and 13 families (81 people), who were outsiders. 2,127 males and 2,034 females were literate. There were 785 inhabited houses, 444 were made of stone, 336 of wood and 5 – of daub and wattle; roofs of 78 of those were made of wood, 704 – of straw, 3 – of soil. There were 54 industrial enterprises, 5 taverns, 11 stores. The settlers had 741 ploughs, 4,293 horses (both working and non-working), 2,602 cows and calves, 5,280 sheep, 1,686 pigs and 869 goats, 5 bee-gardens with 34 bee-hives. In 1885 annual fees and duties amounted to 24,007 rubles, there were no arrears. The allotted land was 17,174 dessiatinas of convenient land (including 12,464 dessiatinas of arable land) and 4,294 dessiatinas of inconvenient land, total: 21,468 dessiatinas. According to the valuation committee of 1859 the settlers got 12,463 dessiatinas 1,600 sazhens of arable land, 122 dessiatinas of convenient steppe, 260 dessiatinas 200 sazhens of farmstead land and kitchen-gardens, 517 dessiatinas 300 sazhens of meadowland, 982 dessiatinas of pasture land, 1,566 dessiatinas 1,900 sazhens of forest and bushes, 5,556 dessiatinas 1,910 sazhens of inconvenient land. According to the ownership papers there are 17,174 1/3 dessiatinas of convenient and 4,294 dessiatinas of inconvenient land. The soil is mostly chernozem (black earth), excluding 1/4 of the allotted land, where it is clay and salty. The land is divided between males, each one has 3 dessiatinas of arable land. Kitchen gardens are used mostly for growing potatoes, cabbage, cucumbers, very few sow tobacco. Water-melon and melon cultivation is developed insignificantly. Not everyone has gardens. Those who have them grow mostly apple trees, cherries and other berries. The system of land management is three-field. The land is worked with ploughs. Some house owners rented land in 1887: winter field dessiatina was 8 rubles, spring field dessiatina was 6 rubles. They can also rent land from other settlers, many house owners lease land. Many people also trade. Carrier trade is the most developed one. In 1887 about 300 people were in this business. 143 people were engaged in seasonal work in other places, among them were 129 hired men, 2 bricklayers, 5 tanners, 4 millers, 3 traders. In the colony 547 people were engaged in trade: 89 hired men, 2 coopers, 13 fullers, 6 bricklayers, 16 tanners, 39 blacksmiths, 78 wheel-wrights, 19 millers, 9 (sheepskin) fur-dressers, 20 shepherds, 2 bookbinders, 7 sawyers, 14 carpenters, 19 tailors, 25 shoemakers, 1 locksmith, 28 joiners, 6 watchmen, 36 weavers, 28 traders, 10 saddle-makers. Among trade and manufacturing enterprises owned by the settlers there are: 3 stores selling manufactured produce, 6 stores selling trifles, 4 stores selling wine, 6 wind flour mills, 6 oil-mills, 5 tanneries, 7 joineries, 11 shoemaker’s shops, 5 tailoring shops, 11 smithies. According to the Saratov Province Statistics Committee (1891) there were 727 households, 5,202 males, 4,998 females, total: 10,200 people of both sexes. According to Norka Volost Board (1894) Norka was situated on the hill, on the Norka river, very close to springs with excellent water. The church that they have now is new, wooden with metal roof, sanctified in 1881. The village administration building was opened in 1864, medical attendant’s office – in 1834; church school – from the time of the colony’s foundation, Russian school – in 1868. Zemstvo driving station has 3 horses. In 1894 there were 713 buildings, among them: Volost Board building, the village administration building, pastorate, 3 schools. 27 buildings were brick, 319 – wooden, 382 were made of stone; 29 had metal roofs, 57 – board roofs, 642 – straw roofs. There were 5,302 males and 5,216 females, total: 10,518 people of both sexes in 1894. They were Germans, Reformists, all of them make up one Norka village community. They are farmers, besides there are 10 blacksmiths, 7 joiners, 12 wheelwrights, 10 shoemakers, 6 tailors, 4 stove-setters, 2 bookbinders, and 250 people engaged in sarpinka (printed calico) weaving. The allotted land is divided in the following way: 259.8 dessiatinas are taken by farmsteads, 12,463.3 dessiatinas is arable land, 829.9 dessiatinas – shrubbery, 737 dessiatinas – forest, 517.1 dessiatinas – meadowland, 2,367.2 dessiatinas – pasture, and 4,294.1 dessiatinas – inconvenient land, total: 21,468 2/5 dessiatinas. It is considered that Norka is 10 verstas from the colony Splavnukha, 20 verstas from Talovka, 18 verstas from Rybushka (Saratov uyezd), 7 verstas from Sergievka (Saratov uyezd); Atkarsk uyezd: 25 verstas from Kopeny, 25 – from Shiroky (Wide) Karamysh, 18 – from Bol’shaya (Big) Dmitrievka, 65 – from Saratov, 120 – from Kamyshin. According to S.A. Shcheglov, Norka is that far from other volost villages of Kamyshin uyezd: Antipovka – 157 verstas, Akhmat – 40 verstas, Banny – 55, Burluk – 95, Verkhnyaya Dobrinka (Dreispits) – 51, Guselka – 88, Zolotoye – 50, Rosenberg (Ilovlinskaya) – 100, Kamenka – 55, Kotovo – 95, Krasny Yar – 74, Lopukhovka – 88, Lemeshkin – 70, Linevo Ozero – 57, Nizhnyaya (Lower) Dobrinka – 62, Oleshnya – 32, Rudnya – 70, Salamatino – 135, Ust-Zolikha (Sosnovskaya) – 25, Tarasovo – 92, Tonovka – 20, Verkhnyaya (Upper) Kulalinka – 99, Kamyshin – 125 verstas. Norka volost borders in the north upon Saratov uyezd, in the east – upon Sosnovka volost, in the south-east – upon Tonovka Volost, in the south-west – upon Oleshnya Volost, and in the west – upon Atkarsky uyezd. Norka volost is situated in the north of Kamyshin uyezd. There are rivers flowing on its territory: at its east boundary – the Karamysh river that takes the Splavnukha river and the Norka and the Rybka rivers (these two rivers are flowing at the boundary with Saratov uyezd) in here. In the very western part of the volost only small streams start, flowing to the Medveditsa. The Volost is settled by Germans, who came from different parts of Germany in 1764-66 and there are only two colonies in it: Old Norka and Splavnukha (Huck). According to the Volost Board, in 1894 there were 8,979 males and 8,848 females, total: 17,827 people in the volost. (1862 List of Settlements of the Central Statistics Committee; Klaus Our Colonies, 1869; Collection of Province Zemstvo, 1891, Volume XI; Documents of the Province Statistics Committee, 1892; Documents of Norka Volost Board, 1894; Maps: 1892 ordnance survey map of the General Staff and 1894 Zemstvo map). We came across the name Norka in other places in Saratov Province, e.g. in Petrovsky uyezd - the Norka river flowing into the Uza from the left (left tributary of the Sura river); the village Mordovskaya Norka on the Uza river and the village Russian Norka (a.k.a. Arkhangel’skoye) on the Norka river. Pulkovo - 15 kilometers from St. Petersburg. The main observatory is located here. The observatory was built in 1833-39, 75 meters above the sea level, in latitude 59° 19' 40" North. Pulkovo meridian is in longitude 30° 19' 40" East from Greenwich. Dessiatina - Russian area measure of 2.7 acres. Sazhen - Russian measure of length equal to 2.13 meters or about 7 feet. Zemstvo - Czar Alexander II implemented the zemstov system (elective district council) of local government that was represented at the lowest level by the mir (village government and cooperative) and volosts (similar to English county). Minkh, A. N. Historic and Geographic Dictionary of the Saratov District (Saratov, 1898), pgs. 688-691.